Another surprise for the Google I/O 2103 slipped out of Google’s sleeve. Mingchi Kuo from KGI Securities released a research note that unveils the specs and technical details of New Nexus 7 coming with a quad-core processor. Yes, this is the second generation of Nexus 7 and made by Asus as they made the current one too. Google will be selling this tablet for $199 but here in the UK we have to pay about £199 as Google always put their prices that way and I don’t like it. Google hasn’t announced any price for the UK market yet and they are losing $5-10 on each tablet. Google has made a lot of upgrade with this second generation Nexus 7 and they didn’t want to go for the competition with the name Nexus 7 2 or version 2 or something. I guess they want to stand out of crowd and show themselves unique by giving a second version of tablet a nice name. The tablet is equipped with 2 cameras, rear 5 MP camera and front facing HD camera and the current Nexus 7 has only 1 camera. A fantastic upgrade Google did by putting the functionality of Qi wireless charging, giving you the comfort to use it anywhere in the room while its being charged. Such a nice feature, isn’t it? The new nexus 7 will have more thinner bezels, featuring a plastic case making it more thinner and will more comfortable in hand. We are expecting for a 16 GB & 32 GB version and another 32 GB + 3G version to be released like the current Nexus 7. 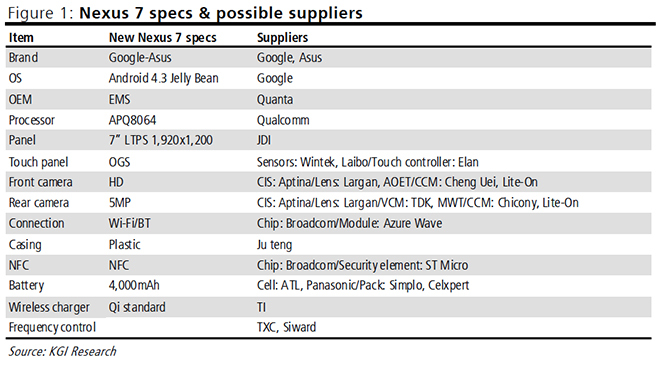 The amount of RAM this New Nexus 7 got we don’t know yet but we can hope for a minimum of 2 GB. At least, Google should put 2 GB RAM into this tablet otherwise there will be no point to make such a nice device. We will soon know when Google announce it on I/O 2013.